The Complete Art of Fullmetal Alchemist Review – AiPT! An impressive collection of art spanning the series’ entire run and beyond. When it comes to finding a gift for someone who loves a particular franchise but who already owns all of its actual installments, you can’t do much better than an art book. 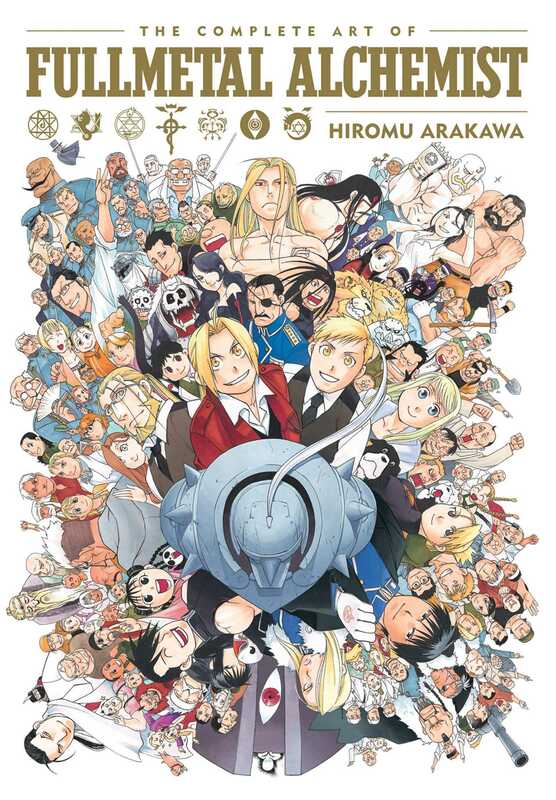 Fortunately for Fullmetal Alchemist fans, Viz Media has just released such a book for Hiromu Arakawa’s classic shonen manga. The Complete Art of Fullmetal Alchemist features nearly 300 pages of artwork, including color pages from series itself as well as promotional art, tankōbon covers, and more. The collection definitely sounds cool, but does it live up to its potential? This book impressed me before I even opened it. It’s a very nice hardback, and it’s huge–8′ 1/4″ by 11′ 3/4″ to be exact. The cover illustration is a group shot with virtually every memorable character from the series, which bodes well for the scope of the contents. Fortunately, the art included doesn’t disappoint. Because all of the manga’s color pages are included, you can track the story’s development just by flipping through these pages. Not only does reading the book give a solid impression of the series’ narrative arc, it also allows one to track Arakawa’s artistic improvement over time. The pencils from Fullmetal Alchemist’s early days, though expressive, were a bit rougher and less polished than those in later chapters. The farther into the collection one gets, the cleaner and more striking the visuals. Of course, the success of any art book is ultimately dependent on the quality of the art itself. Even in the earlier, rougher pages, Arakawa’s work impresses. Her characters’ facial expressions are joyfully expressive, and many of her designs are fantastic. Who doesn’t love Alphonse Elric’s armor, for instance? The coloration is also great. Not only is Arakawa’s painting just plain pleasing to look at, but it also shows good understanding of light sources, shadows, movement, and distance. This book is full of examples that show how you don’t necessarily need to use a lot of lines in order to convey necessary detail and strong fundamentals. All in all, there’s a sense of softness to the work that’s very appealing. In terms of extra content besides the art there’s not much here. There is a brief interview with Arakawa at the end which is a nice touch, but it doesn’t actually delve very deeply into any of the book’s subject matter. We also get a step-by-step walkthrough of Arakawa’s process creating one specific piece, which is cool but nothing extraordinary given that the image in question is somewhat generic. All in all the focus here is, appropriately, on the art, but readers looking for substantial content that’s not already available elsewhere may feel disappointed. Overall, The Complete Art of Fullmetal Alchemist is a nice collection. Physically speaking it’s very impressive, with high quality paper and an almost imposing size. The art itself of course is largely great. Arakawa’s fundamentals are strong and her style is pleasing to look at, and it only becomes more so as the works gets more recent. On the downside there’s not much here in terms of bonus content, and some of the older art is admittedly a bit rough. Nonetheless, I would recommend this book to any Fullmetal Alchemist fan. An impressive collection of artwork from a beloved series.